This series has explored what it takes to get a KOM on Strava, but what about the pros? Don’t they come home with a sackful of KOMs after every training ride? Which pro rider tops the most Strava leaderboards? You can follow over a thousand pro athletes on Strava. These include runners, triathletes, mountain bikers and professional cyclists. Although you will not find Peter Sagan, Chris Froome, Nairo Quintana or Alberto Contador (you can ignore all the fake Strava ids with these names), there is a good selection of UCI team riders. There are also riders who do not claim Strava pro status, like some guy called Phil who recently went out for an afternoon ride. Some pros upload just a limited number of rides, for example, Marianne Vos only has 243 rides on Strava, with nothing new since December. Other riders, such as Ian Stannard, upload their rides, but withhold their (monstrously high) power data. Nevertheless, many pro riders are more open about making their data available on Strava, including power. Take a look at the Col d’Eze segment on the final stage of Paris Nice. The little lightning bolt symbol indicates that the rider was using a power meter, but rather confusingly, some pro riders (Team Sky) are able to hide their average power for the ride, in which case the figure is a Strava estimate. But you can find the real number by highlighting the segment in the analysis view of the ride. This review considers over 200 active professional road cyclists who are on Strava. The riders with the highest number of KOMs need to have uploaded a lot fast rides, in regions where many segments have been recorded. Here are the current top 10 pro riders from the sample. A bit further down the list, Michal Kwiatkowski has 559 KOMs, including eight that he picked up in his Milan San Remo victory. After riding the first 140km at a relatively easy 35kph and an average power of just 124W, he upped the effort to traverse the Passo del Turchino. His power and heart rate rose progressively all the way to the Cipressa, from which point he earned a KOM for the segment to the finish. He claimed four KOMs as he followed Peter Sagan’s dramatic attack on the Poggio, though these would have undoubtably been Sagan’s, if he’d put his data on Strava. Viewing the ride analysis, we see that after over seven hours of riding, Michal ascended the 3.6km 4% climb at 37kph, generating 443W (about 6.5 W/kg) for 5 minutes and 47 seconds, rather than the 536W estimated on the leaderboard. He peaked at over 900W near the summit as he an Alaphilippe desperately fought to get onto Sagan’s wheel.Lauren ten Dam has the most KOMs by a long way, though he does match Maryka Sennema’s haul of QOMs. Interestingly there are three women in the top ten, in spite of the fact that most of the riders in the sample were men. It is no surprise to see Elisa Longo Borghini and Annemiek van Vleuten at the head of the women’s rankings. Niki Terpstra follows his Dutch compatriot, while James Gullen is the leading Brit, followed by Dan Evans representing Wales alongside Dani King. Thibaut Pinot and Romain Bardet are the kings of the French mountains. Nice-based American rider Joe Dombrowski also makes the top ten. The next blog will explore some more feats of the professionals. So far this series of article has explored to the time of year, wind and weather conditions when riders have set their best times on the Strava leaderboard, using the popular Tour of Richmond Park segment as a case study. This blog considers how the attributes of the cyclist affect the time to complete a segment. The most important components are power, bodyweight and aerodynamic drag area or CdA. Your best chance of picking up a KOM is to target a segment that matches your strengths as a cyclist. A power curve plots the maximal power a cyclist can sustain over a range of time periods. Ideally, the curve is plotted from the results of a series of maximal effort tests performed over times ranging from 5 seconds to an hour. Alternatively, Strava Premium or software such as Training Peaks or Golden Cheetah can generate power curves from a history of power data files. Power can be expressed in Watts or in Watts per kilogram, as in the example below. The shape of the power curve reveals a lot about the characteristics of the cyclist. Dr Andrew Coggan explains how this information can be used to define a cyclist’s individual power profile. In the chart above, the 5 minute and functional threshold (1 hour) Watts/kg rank more highly than 5 second and 1 minute figures, indicating that this cyclist can generate fairly high power for long periods, but has a relatively weaker sprint. For a heavier rider this profile would be consistent with a time trialer, who can generate a high absolute number of Watts, whereas a light rider with this profile may be a better climber, due to a good sustainable power to weight ratio. If you have a power meter or access to a Wattbike, it is well worth gathering this data for yourself. It can help with training, racing or selecting Strava segments where you have the best chance of moving up the leaderboard. The power required to maintain a constant speed, V, needs to balance the forces acting on a rider. Aerodynamic drag is due to the resistance of pushing the rider and bike frame through the air, with some additional drag coming from the rotating wheels. Drag can be decreased by reducing frontal area and by adopting a streamlined shape, while wearing a skinsuit. Additional mechanical factors are due to gravity, the rolling resistance of the tyres on the road surface and drive chain loss. Since the power needed to overcome aerodynamic drag scales with the cube of velocity, it is the dominant factor when riding fast on flat or downhill segments. However, on a climb, where speed is lower, the power required to do work against gravity quickly becomes important, especially for heavier riders. Consider a rider weighing 60kg, call him Nairo, and another weighing 80kg, say Fabian. Suppose they are cruising along side by side at 40kph. Under reasonable assumptions, Fabian rides at 276 Watts or 3.4 Watts/kg, while Nairo benefits from a smaller frontal area and lower rolling resistance, requiring 230 Watts, though this equates to 3.8 Watts/kg. Reaching a 5% hill, they both increase power by 50%, but now Nairo is riding at 27kph, dropping Fabian, whose extra weight slows him to 26kph. You can experiment with this interactive chart. Climbers are able to sustain high force on the pedals, taking advantage of their ability to accelerate quickly on the steepest slopes. Time trialers generate high absolute power for long periods, on smoother terrain, while maintaining an aerodynamic tuck. Sprinters have more fast-twitch muscle fibres, producing extremely high power for short periods, while pedalling at a rapid cadence. 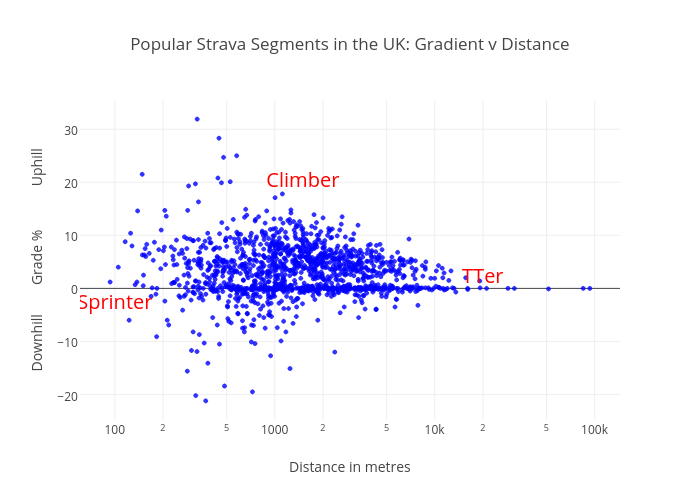 The following chart shows the gradient and length of 1364 popular Strava segments from around Britain. Distances range from 93m to 93km, with an average of 2.3km. Gradients are from 21% downhill to 32% uphill (Stanwix Bank Climb). You should be able to click on the chart (no need to sign up) for an interactive version that allows you to zoom in and display the names of the segments that suit your ability: short segments for sprinters, steep ones for climbers and longer flat ones for TTers. The Tour de Richmond Park segment is 10.8km with an average gradient of zero, so it is no surprise that the KOM is held by an accomplished time trialer. The next blog takes a look at QOMs. Are women different?